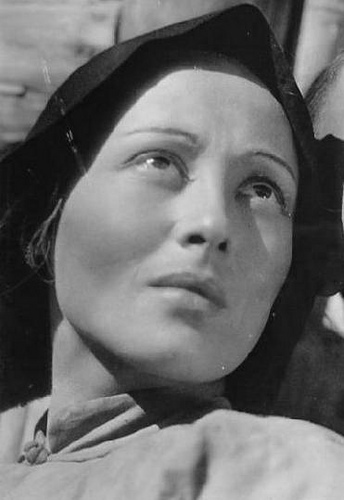 I first learned of Luise Rainer—as with so many other of the creative individuals of her generation—through the diaries of Anaïs Nin. If I recall correctly, they befriended each other about the time that Rainer was separating from her first husband playwright Clifford Odets and what sticks in my memory is Nin's descriptions of Rainer's suffering at the time, especially one episode where she sat on the steps of her home painfully enunciating the word "masochism", which lends credence to the ascription by film historian Emanuel Lefy that Luise Rainer was the "most extreme case of an Oscar® victim in Hollywood mythology" (All About Oscar: The History and Politics of the Academy Awards, Continuum International Publ. 2003, p. 314). 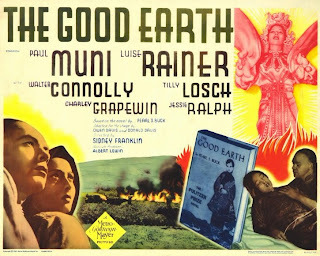 It wasn't until years later that I caught Rainer's Oscar®-winning performance as the Chinese peasant woman O-lan in The Good Earth (1937), which came offered to participants at the first-ever TCM Classic Film Festival in a brand new print from Warner Bros., with Rainer—at 100!—present to converse with TCM host Robert Osborne. 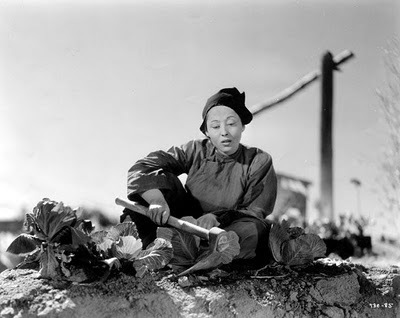 The TCM notes for The Good Earth state: "Luise Rainer became the first actor to win two Oscars and the first to score back-to-back wins with a role that gave her fewer lines than the average supporting performance. Playing the devoted, long suffering farmer's wife in Pearl Buck's epic tale of life in a remote Chinese province, she didn't need words. She relied on her expressive eyes and exquisite body language to bring O-Lan to life. The performance was showcased in one of MGM's most impressive productions. The studio had devoted six years to developing this tale of a Chinese family struggling to survive war, famine and a spectacular plague of locusts. 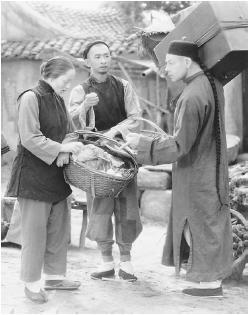 The original director, George Hill, shot location footage in China while studio researchers sent hundreds of home furnishings and props back to Hollywood. After Hill's suicide, the project lay dormant for two years until Sidney Franklin took it over. 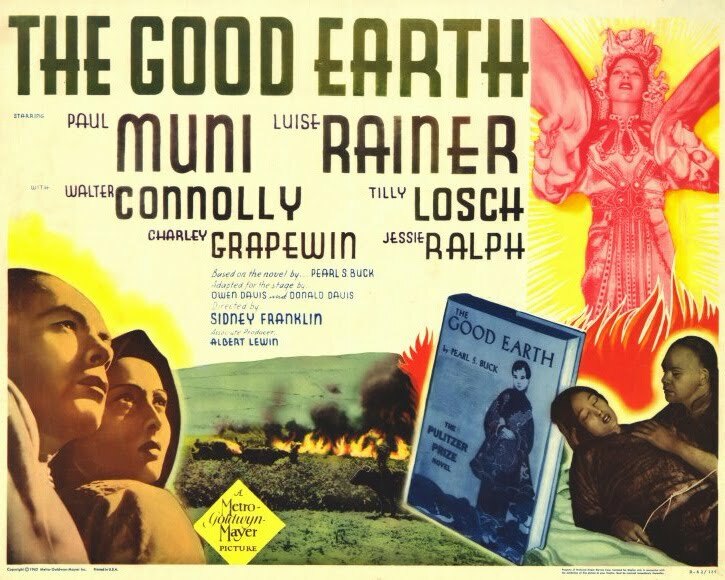 Although MGM production head and "boy wonder" Irving G. Thalberg had originally planned to shoot The Good Earth entirely in China, he eventually had technicians transform 500 acres of Chatworth, CA, into terraced Chinese farmland. This was the last project Thalberg brought to fruition and he fought tirelessly to realize Buck's vision to the fullest. When he died shortly after principal photography ended, Mayer gave Thalberg what he would never take himself—on-screen credit for his work." Led to the stage of The Egyptian Theatre on the offered arms of two young strong men, Rainer beamed as the audience took to their feet in a cheering standing ovation. The event, however, proved a near disaster. Though Rainer had managed to make it to Hollywood from Vienna inbetween spewing plumes of ash from Iceland's erupting volcanoes, she accidentally broke her hearing aid earlier in the morning and could not hear a word of what Osborne was asking her. With cameras rolling—the conversation was being filmed for future broadcast on TCM—the otherwise poised Robert Osborne seemed momentarily nonplussed until someone from the audience shouted out the suggestion that he write down his questions and rushed to the stage with a notebook pad and pen so he could do so. Ever gracious, Osborne expressed his gratitude to his audience's ingenuity. Rainer apologized for the fact that she had to limp into the theater assisted by others. Her comment underscored the commonly-held belief of yesteryear's "stars" that they owed glamour to their fans. Asked how she developed her characterization of O-lan, Rainer said that she first of all fought against the excessive make-up the studios wanted to apply to "turn" her Chinese. "Are you mad?" she told them. She refused to wear such a mask. As an actress who worked "from the inside out", she believed that—if she couldn't become O-lan—no amount of make-up was going to do the trick. She claimed her interpretation was largely gestural, based upon the small gestures she had observed in Chinese women. It's difficult not to address the faint trace of racism in such a comment, let alone that many today believe the role should have rightfully gone to Anna May Wong, who—by MGM's refusal to consider her for the role—faced the most severe disappointment of her career. Despite consideration of what Wong might have brought to the role of O-lan, wide berth must be given to Luise Rainer who had her own issues with the Hollywood system. On the set during one of the crowd scenes Rainer dropped her pocketbook and as she bent down to look for it she knocked heads with one of the Chinese extras who was helping her search. The extra recoiled, shocked, but then smiled and let out a garbled laugh, and in that moment Rainer knew that this Chinese woman was O-lan and that she would base her character on this woman, who she found demure and loveable. 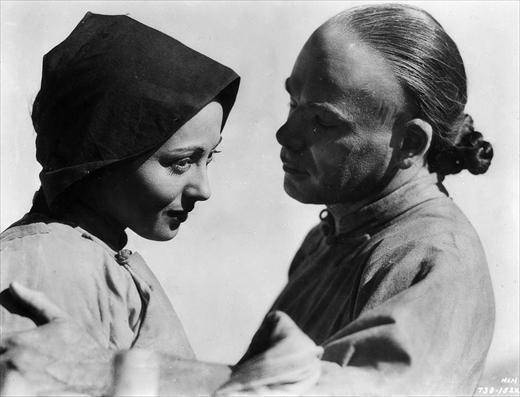 Asked about working with co-actor Paul Muni, who played her husband Wang Lung, Rainer recalled that he was a "naughty" man who was quite different from her not only in his acting style but how he approached the project. They were never on a first-name basis. She called him "Mr. Muni." Muni's wife would sit at the monitors to make sure her husband looked better than anyone else. 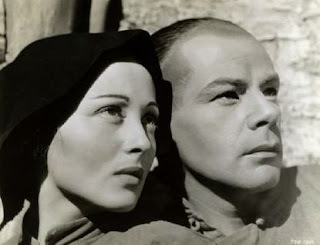 "I was not so much in love with him," Rainer admitted. As for what it was like to work with Louis B. Mayer, Rainer recalled that—in Mayer's eyes—she was "a little crumb". He couldn't make her out because she wasn't interested in becoming a "star." He called her a Frankenstein and said that—if they weren't careful—she would end up ruining MGM. She refused to sit on his knee like the other young actresses and not only was she disinterested in being one of his stars, she didn't even want to be one of the tools in his dream factory. She wanted to create beautiful films and create characters whose feelings she could share with others. It was the process of creating her characters that mattered to her. She didn't believe in "acting"; she believed in being. For her the human personality possessed as many layers as an onion, of which an actor was required to be aware, so that as they peeled back each layer—ranging from murder to love—they could eventually arrive at deep feeling, deep beauty. It is the warmth of human beings that enhances her own existence, Rainer attested. She recalled that Greta Garbo adored her and her beauty, her face, down to her perfect feet. When Osborne asked her, "What about Luise Rainer today?" she promptly answered, "Here!" She touched upon her love for her first husband Clifford Odets and how their marriage failed in divorce. Her second husband, publisher Robert Knittel, remained by her side for 47 years before his death. She adored him because he saw her as the center of the universe. "As do we," Osborne concluded the session, despite Rainer's protestations that she wanted to have more time with the audience, to answer their questions. Such was not to be. Cross-published on Twitch. 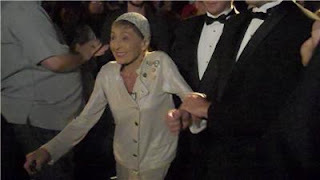 The photograph of Luise Rainer being led into the Egyptian Theatre courtesy of Movie Morlocks. Thanks so much for writing this up! I just happened to be looking at the movie again this morning, so it was a coincidence and a thrill to find this entry. Thank you, Nick, for stopping by to comment. Hope the transcript added a layer of enjoyment to your recent viewing of The Good Earth.